yeah, its no Harry Potter but im still stoked to see it. Next month, Warner Bros. will see if there's still magic left in that old wand of theirs when they release Fantastic Beasts and Where to Find Them, a film set in the Harry Potter universe but takes place many decades before the original film series. 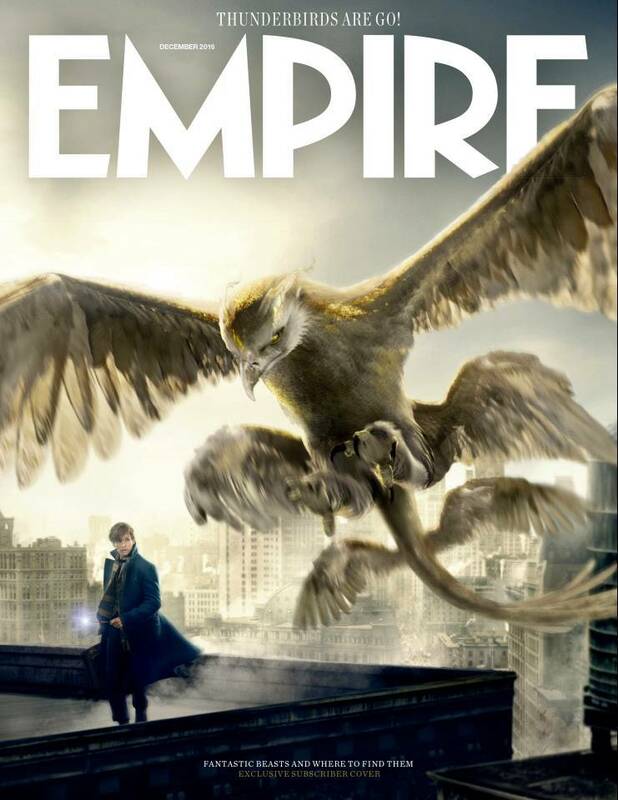 In the film, magizoologist Newt Scamander (Eddie Redmayne) heads to America to study magical creatures that inhabit the country, and one of those magical creatures is the Thunderbird, which is featured on Empire's subscriber-only cover and will go on sale Thursday, October 27. The Thunderbird is a giant, magical bird that is held in high regard. So much so, that one of the four Houses at America's Ilvermorny School of Witchcraft and Wizardry is named after the creature. "The Thunderbird is a large, regal avian creature native to the arid climate of Arizona," Fantastic Beasts visual effects supervisor Christian Manz told EW. "Its head is similar to that of an eagle or, in the wizarding world, a Hippogriff. Its multiple powerful wings shimmer with cloud-and sun-like patterns and their flapping can create storms. Thunderbirds can also sense danger." Fantastic Beasts and Where to Find Them is an all-new adventure returning us to the wizarding world created by J.K. Rowling. Academy Award winner Eddie Redmayne (The Theory of Everything) stars in the central role of wizarding world magizoologist Newt Scamander, under the direction of David Yates, who helmed the last four Harry Potter blockbusters. Fantastic Beasts and Where to Find Them opens in 1926 as Newt Scamander has just completed a global excursion to find and document an extraordinary array of magical creatures. Arriving in New York for a brief stopover, he might have come and gone without incident…were it not for a No-Maj (American for Muggle) named Jacob, a misplaced magical case, and the escape of some of Newt’s fantastic beasts, which could spell trouble for both the wizarding and No-Maj worlds. Fantastic Beasts and Where to Find Them also stars Katherine Waterston (Steve Jobs, Inherent Vice) as Tina; Tony Award winner Dan Fogler (The 25th Annual Putnam County Spelling Bee) as Jacob; Alison Sudol (Dig, Transparent) as Tina’s sister, Queenie; Ezra Miller (Trainwreck) as Credence; two-time Oscar nominee Samantha Morton (In America, Sweet and Lowdown) as Mary Lou; Oscar winner Jon Voight (Coming Home, TV’s Ray Donovan) as Henry Shaw, Sr.; Ron Perlman (the Hellboy films) as Gnarlack; Carmen Ejogo (Selma) as Seraphina; Jenn Murray (Brooklyn) as Chastity; young newcomer Faith Wood-Blagrove as Modesty; and Colin Farrell (True Detective) as Percival Graves. (Photo : Rob Stothard/Stringer) J.K. Rowling announced that the Harry Potter spin-off world of "Fantastic Beasts and Where to Find Them" will have 5 movies instead of the original trilogy. J.K. Rowling announced that the Harry Potter spin-off world of "Fantastic Beasts and Where to Find Them" will have 5 movies instead of the original trilogy. As reported by News Every Day, Harry Potter fans are in elations as J.K. Rowling officially announced during an event in London that fans will be seeing more of "Fantastic Beasts and Where to Find Them." She said that it will now have 5 films instead of the original trilogy. According to US Magazine, Rowling said that "there are going to be five movies, now that I've been able to properly plot them out." "We always knew that there would be more than one," she added. Telegraph UK also reported that she happily broadcasted to fans that in the film "Fantastic Beasts and Where to Find Them," which will feature Dumbledore. The catch is, it's not the Dumbledore most fans are used to. According to Rowling, it will be the young Dumbledore and fans are definitely intrigued by this. In addition, Dumbledore's nemesis, the dark wizard Gellert Grindelwald will also be in the movie "Fantastic Beasts and Where to Find Them." The news is particularly substantial since Rowling had said before that Dumbledore who's to be the future headmaster of Howarts was gay. Not just gay, but in love with his nemesis Grindelwald. According to the same report, both of them started out as friends in school before they grew apart after the unfortunate death of Dumbledore's sister. Both have chosen different paths as Dumbledore went to become a good wizard as opposed to Grindelwald who became a dangerous force. Dumbledore eventually defeated his old friend. Rowling specifically said that Dumbledore's feelings were unrequited, "Fantastic Beasts and Where to Find Them" upcoming films should give fans the answers to the questions on their complicated relationship. Whip out your wands: the Fantastic Beasts and Where to Find Them sequel has a title and a plot synopsis. Warner Bros. revealed the Harry Potter prequel sequel (that’s going to get confusing) title as Fantastic Beasts: The Crimes of Grindelwald, along with the first story details. The film will follow the events of the first Fantastic Beasts, which found the evil wizard Gellert Grindelwald (Colin Farrell before being revealed as a bleach-blonde Johnny Depp) captured thanks to Newt Scamander’s (Eddie Redmayne) efforts. And the new title is not the only magic that Warner Bros. has in store for us: the announcement of the title comes in the form of a video teaser masquerading as a magical moving picture of the cast. The teaser shows the cast of The Crimes of Grindelwald in costume — and in character — as they pose for the picture, partially frozen until the midway point, when a dark fog overtakes the screen and reveals the title and the November 16, 2018 release date. 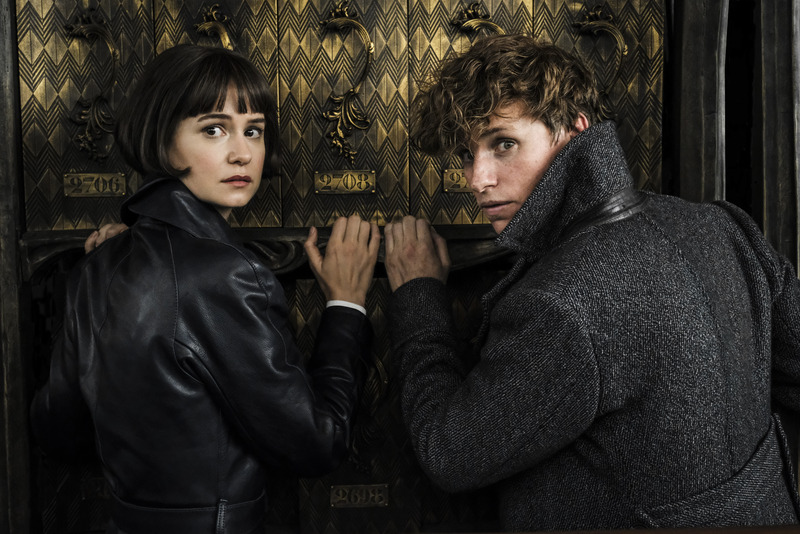 Among the returning cast are Eddie Redmayne as the magizoologist Newt Scamander, Katherine Waterston as the reinstated MACUSA Auror Tina Goldstein, Alison Sudol as her sister Queenie, and Ezra Miller as Credence, the Obscurial who wreaked havoc throughout New York in the last film. While he presumably met his end at the conclusion of the film, it had been recently revealed that he mysteriously survived, which could have huge ramifications in The Crimes of Grindelwald. 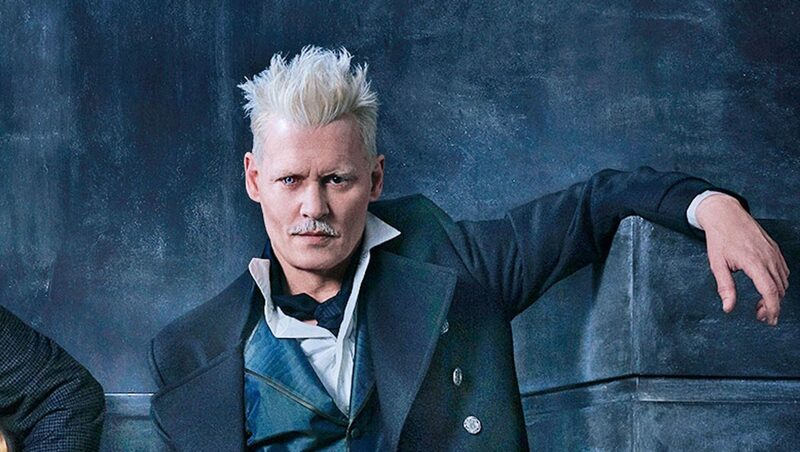 And one more returning cast member is the titular Grindelwald, played by Johnny Depp, though only for a mere minute in the first Fantastic Beasts. In case you’re unfamiliar with the oddly named dark wizard, he is Albus Dumbledore’s mortal enemy — and their decades-long battle is one of the wizarding world’s most epic feuds. His legacy as one of the most evil dark wizards would later be overturned by Voldemort, but he will obviously cut an ominous figure in the newest entry into the Harry Potter franchise. 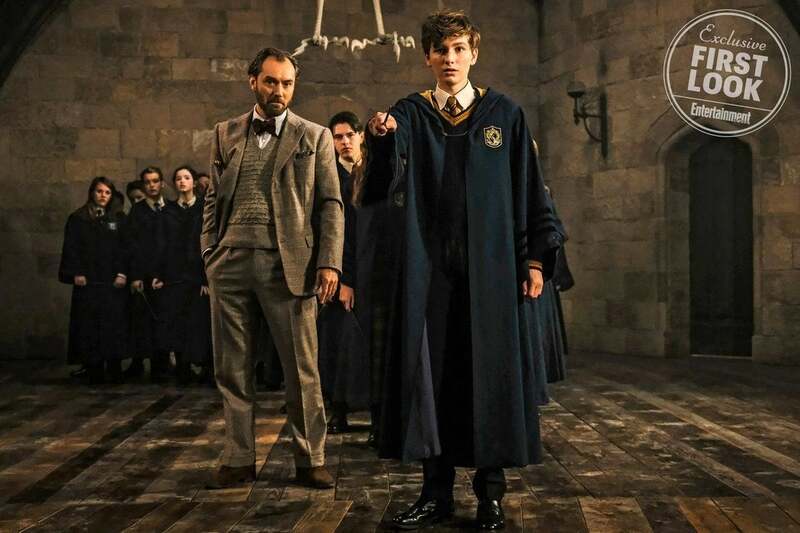 New cast members include Jude Law as young Albus Dumbledore (rocking a slick beard and coat), Claudia Kim as a Maledictus, a “carrier of a blood curse that destines her ultimately to transform into a beast,” Callum Turner as Newt’s older brother, a war hero and Head of the Auror Office at the British Ministry of Magic; and Zoe Kravitz as Leta Lestrange, who was mentioned in the last film as the girl who broke Newt’s heart and now is engaged to his brother. David Yates returns to direct the next Fantastic Beasts, which is written by Harry Potter author J.K. Rowling and produced by David Heyman, J.K. Rowling, Steve Kloves and Lionel Wigram. New FANTASTIC BEASTS 2 Photo Features Johnny Depp's Grindelwald And The Mysterious "Rosier"
A new image from Fantastic Beasts: The Crimes of Grindelwald has debuted via USA Today, featuring Johnny Depp's villainous Grindelwald and his new recruit, Rosier (Poppy Corby-Tuech). Check it out! 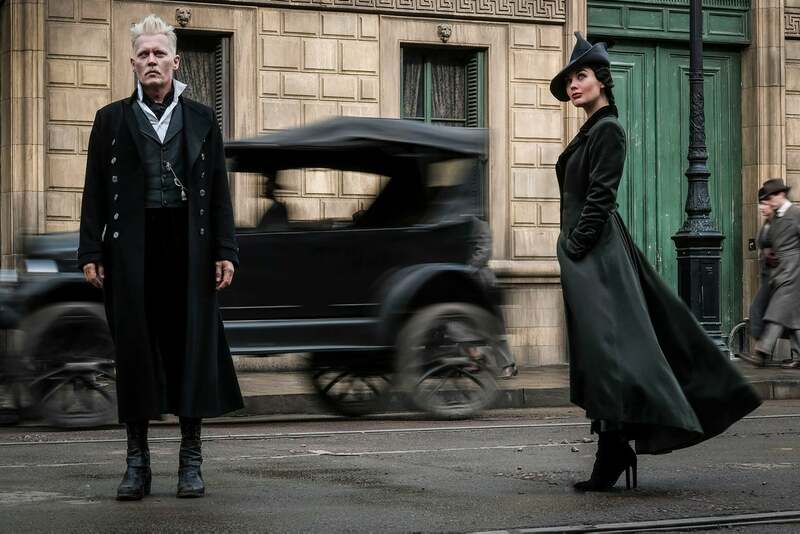 A brand new image from Fantastic Beasts 2: The Crimes of Grindelwald has been revealed by USA Today, featuring Johnny Depp as the titular Dark Wizard, along with Rosier (Poppy Corby-Tuech), who will be one of Grindelwald's many recruits. Fantastic Beasts: The Crimes of Grindelwald arrives in theatres on November 16, 2018. With Fantastic Beasts: The Crimes of Grindelwald set to focus on the rivalry between Albus Dumbledore and the villainous magician the sequel is named after, we don't really know what role Eddie Redmayne's magizoologist will end up playing in the J.K. Rowling penned release. That's further emphasised by the debut of this new image which puts the spotlight solely Jude Law's young professor. 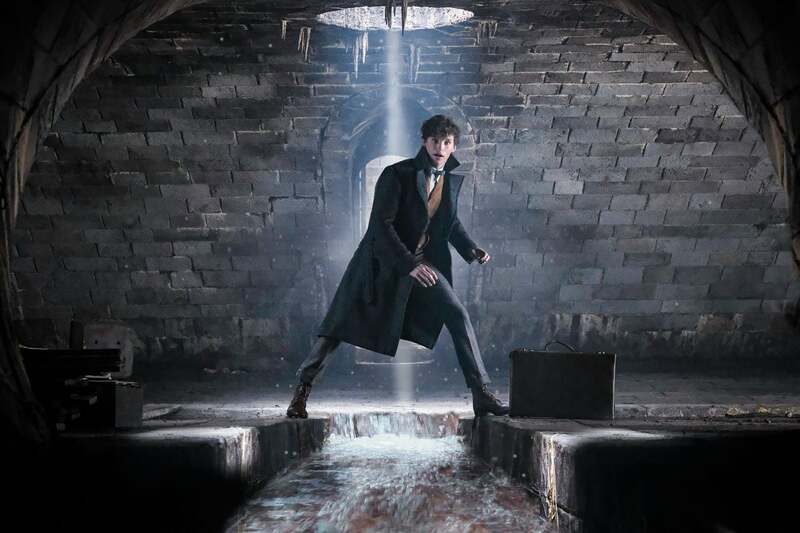 Warner Bros. has also shared every other official image from the movie which has been released so far without watermarks and in high-resolution. You can check those out by clicking the buttons below. Fantastic Beasts: The Crimes of Grindelwald is set to be released on November 16th, 2018. The first instalment earned $814 million at the worldwide box office, so while this franchise isn't quite matching the Harry Potter movies, there's no reason to think this story won't continue being told over multiple movies. What do you guys think of this new image? Let us know your thoughts down below. Warner Bros. released the Fantastic Beasts: The Crimes of Grindelwald trailer and we break down all the Harry Potter references and connections. The now expansive Harry Potter multimedia franchise first kicked off with a novel by J.K. Rowling published in 1997. Over the last two decades, the seven-book series inspired an eight-movie film franchise that has since continued with Fantastic Beasts and Where to Find Them – itself the first installment of a five-movie series. Now, this second film series set in the world of Harry Potter will continue later in 2018 with the debut of Fantastic Beasts: The Crimes of Grindelwald. 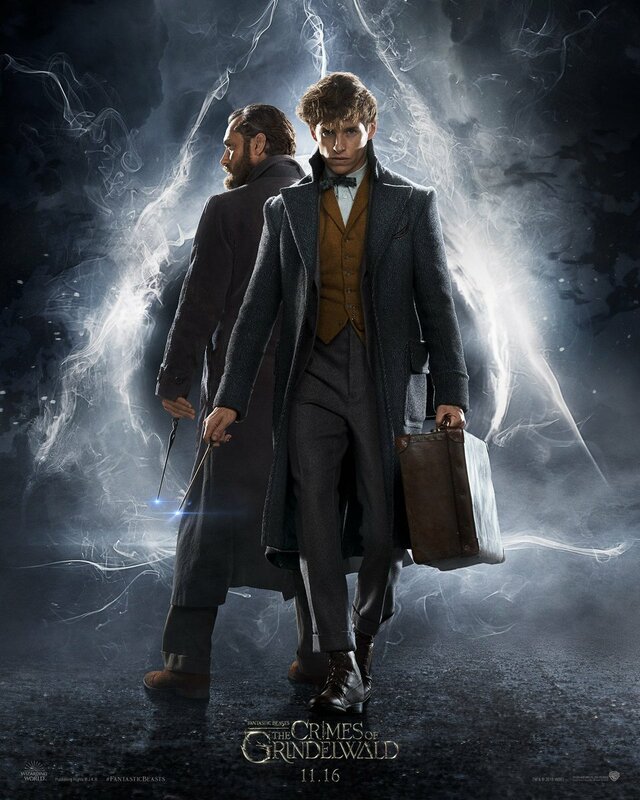 Continuing the stories of Newt Scamander (Eddie Redmayne), Jacob Kowalski (Dan Fogel), Tina Goldstein (Katherine Waterston), and Queenie Goldstein (Alison Sudol), the film will also introduce a younger version of Albus Dumbledore (Jude Law) as they fight against Gellert Grindelwald (Johnny Depp). Though the first Fantastic Beasts movie didn’t feature too many direct connections to the original Harry Potter franchise, the teaser trailer for Fantastic Beasts: The Crimes of Grindelwald is full of references to the story of the Boy Who Lived. Now, we list all the connections between The Crimes of Grindelwald and Harry Potter – in case you missed any. The most major reference to the Harry Potter series is, of course, Hogwarts School of Witchcraft and Wizardry, where young Harry studied for six of his books/movies. The school didn’t appear in Fantastic Beasts, so it’s a major return for the franchise to head into Hogwarts. The scenes in Hogwarts also feature our first look at young Dumbledore – though, peculiarly, he’s in the Defense Against the Dark Arts classroom despite the character being a Transfiguration professor – as well as certain members of the Ministry of Magic. Later in the trailer, we see Newt traveling in London, a major setting in the Harry Potter series, as well as inside the Ministry. Particularly, we see Grindelwald standing in front of the Wizengamot, the high court of law and parliament for wizards. Further, we also see a brief shot of some Thestrals, which are the creatures that pull the carriages bringing students from the train to Hogwarts at the start of term. As revealed in the Harry Potter series, they’re only able to be seen by those who have witnessed death and are considered very dangerous magical creatures. Plus, we see someone shrouded in darkness using the Deluminator, though since it’s presumably in the possession of Dumbledore, he’s likely the one using it. Dumbledore later uses it in the very first scene of the very first Harry Potter book, then gifts it to Ron Weasley in Harry Potter and the Deathly Hallows. That brings us to the final Harry Potter connection: the Deathly Hallows symbol in the Crimes of Grindelwald trailer. As fans will remember, the Deathly Hallows are made up of three key artifacts that together would make the person who wields them the “Master of Death:” the Invisibility Cloak, the Resurrection Stone, and the Elder Wand. When Dumbledore and Grindelwald were friends in their youth, they researched and were focused on tracking down the Deathly Hallows, and it’s likely we’ll see Grindelwald continue that search in the upcoming film. Of course, the Hallows were also a key part of the final Harry Potter book and movie, as Voldemort also became consumed by finding them. So, although Fantastic Beasts and Where to Find Them mostly kept itself separate from the main Harry Potter series, it seems The Crimes of Grindelwald will play up its connections to the original story. Whether there are many more references in the Fantastic Beasts sequel itself remains to be seen, but this first trailer for The Crimes of Grindelwald certainly makes it seem there will be more connection between the two series than previously thought. The Fantastic Beasts films are continuing to explore the history of Harry Potter’s wizarding world, and soon will be getting into the complicated past of Albus Dumbledore. 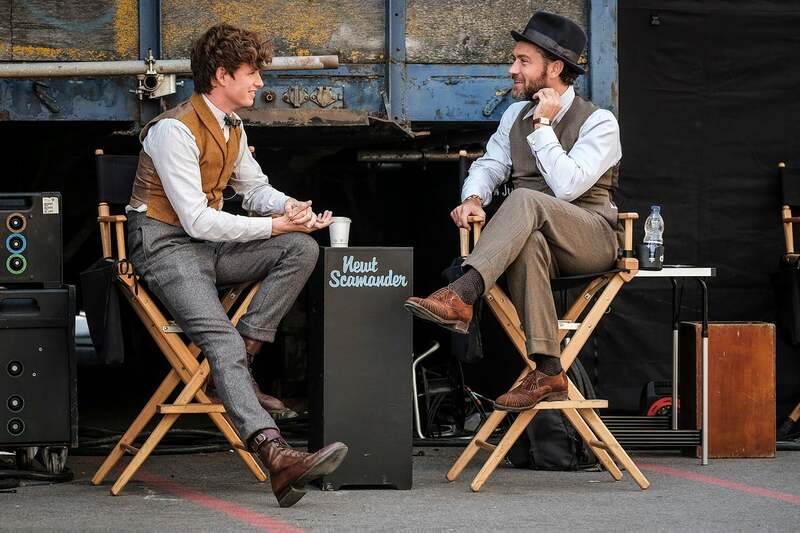 Although the movies center Newt Scamander, the focus is increasingly upon the early Professor, played by Jude Law. As a result, the first trailer for Fantastic Beasts 2 opens with a group of wizards approaching Hogwarts to speak to the Professor. It’s a scene that’s rich in humor, as Dumbledore denies that Newt is his agent in Europe. Later in the trailer, Dumbledore tells Newt that he cannot oppose Grindelwald directly at this time, sending the magizoologist on a mission instead. Harry Potter fans know he will do so in the end, but why is Dumbledore so reluctant now? Although fans thought they knew the answer from Harry Potter and the Deathly Hallows, the trailer suggests there’s something more mysterious at work. As Harry Potter and the Deathly Hallows established, Dumbledore and Grindelwald have a deep and personal history. Grindelwald visited Godric’s Hollow when Dumbledore was only a teenager, shortly after the dark wizard was expelled from Durmstrang. He and Dumbledore became fast friends, both increasingly obsessed with the Deathly Hallows. The two wizards kept in touch for years, continuing to correspond after Grindelwald returned to Germany. But events took a tragic twist. One day, when Grindelwald was visiting again, Albus’s brother Aberforth intervened. He cautioned at the increasing madness of Grindelwald and Dumbledore’s schemes, and enraged Grindelwald. The confrontation turned into a three-way wizard’s duel, leading to the tragic death of the young Ariana Dumbledore. Albus would never be sure whose spell killed his sister, but blamed himself regardless. The tragedy brought an end to the friendship between Dumbledore and Grindelwald. Towards the end of his life, Dumbledore would conclude that his overwhelming sense of guilt was what kept him from standing against Grindelwald’s rise to power. The trailer, however, suggests another reason. It’s certainly no surprise to see that the Ministry of Magic may, at least initially, have been on the wrong side of history – they were just as inactive during the events of Harry Potter. In the trailer, Ministry officials – possibly allied with representatives from foreign Ministries – confront Dumbledore over Newt’s actions. They rightly believe Newt to be acting on Dumbledore’s orders, and are furious at Dumbledore’s intervention. What the trailer suggests is that Dumbledore had to account for British politics; the Ministry of Magic seem to have tried to sit out Grindelwald’s rise, wary of interfering in the affairs of another country. It’s a policy that can best be described as “appeasement,” which was alluded to in the first Fantastic Beasts, and adds even more depth to the conflict between Dumbledore and Grindelwald. Grindelwald has always paralleled the rise of Nazism in Germany. He’s a charismatic sorcerer who rose to power through the 1930s, and committed horrendous atrocities. Furthermore, it’s no coincidence that Grindelwald would ultimately be defeated in 1945 – the year the Second World War ended. Clearly, in the Harry Potter universe, Grindelwald was somehow tied to the Nazi regime. That makes a policy of “appeasement” all the more appropriate. In the 1930s, only a few key figures in Britain dared to speak out about the need to confront Adolf Hitler. Others, like Prime Minister Neville Chamberlain, believed he could be appeased; that there was a limit to Hitler’s ambitions, and that there was no British appetite for another war. It would certainly be ironic to see the Ministry of Magic pursuing a policy towards Grindelwald. Of course, in the end, Albus Dumbledore will indeed choose to step in and confront his old friend. The Fantastic Beasts films will end in 1945, presumably with that famous wizarding duel between Dumbledore and Grindelwald. According to Deathly Hallows, the public mood will change, and the British wizards will beg Dumbledore to intervene directly. Although hesitant, he’ll ultimately do so. And yet, the trailer for Fantastic Beasts 2 suggests the reasons for Dumbledore’s hesitancy were far more complex than those detailed in Deathly Hallows. It’s quite possible that, towards the end of his life, Dumbledore was being too hard on himself; that he actually did get involved as early as possible, and that political forces beyond his control constrained him until 1945. Last edited by JDLM; 2018-03-13 at 01:48 PM..
Hogwarts will always be there to welcome you home. So nothing feels more comforting than seeing Hogwarts for the first time in the Harry Potter spin-off series Fantastic Beasts. But Fantastic Beasts: The Crimes of Grindelwald, the second film in the new five-movie franchise (out November 16, 2018), only gives us a fleeting glimpse of Hogwarts before whisking off on more globe-trotting adventures. This time: Paris. The metropolitan capital of France will be the battleground for the oncoming war against the dark wizard Grindelwald (Johnny Depp), which will be fought by our intrepid hero Newt Scamander (Eddie Redmayne) and a young, hot Albus Dumbledore (Jude Law). Join us on our frame-by-frame breakdown of the first Fantastic Beasts: The Crimes of Grindelwald trailer. First, I just wanted to point out that Fantastic Beasts has a new logo. The logo is a wonderfully vague “Wizarding World,” which probably means it will fold in all Harry Potter-related content in the future. There you are, you beloved Scottish castle. But something is a little off, even as the sweeping shot of the familiar school grounds evoke a feeling of warmth. It’s — hey! Those people are Apparating on school grounds! We know for security reasons that no one can Apparate or Disapparate on Hogwarts grounds — with the exception of Dumbledore and house elves. Is this an innocent overlook of Harry Potter canon on the part of director David Yates? Or is this because Fantastic Beasts takes place 70 years before Harry Potter and perhaps the dire reason for this security measure has not yet taken place? It could be either-or — though to be fair, it does look pretty cool. At first glance, this seems like a simple continuation of the last shot, but the woman in the bright purple dress draws my eye. Why? 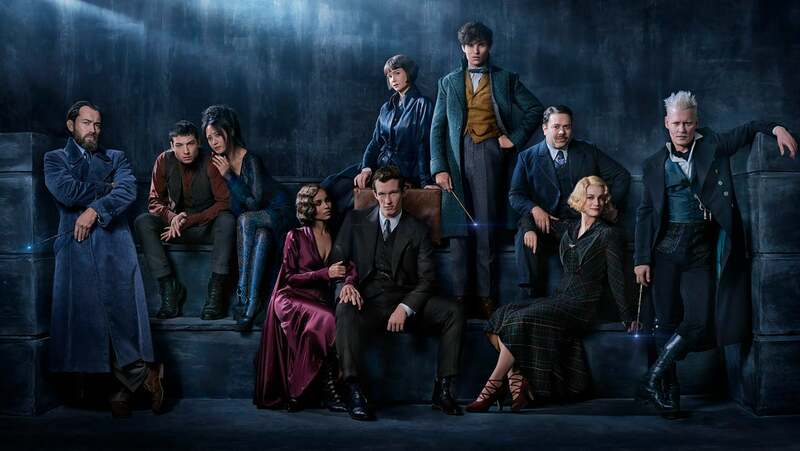 It’s the same outfit worn by Leta Lestrange (Zoe Kravitz) in our first look of The Crimes of Grindelwald, presumably with her fiance Theseus Scamander (Callum Turner) beside her. Yes, Leta, who was Newt’s childhood love, is engaged to Newt’s brother — the head of the Auror office at the Ministry of Magic. We don’t know her job, though we can assume she works for the Ministry of Magic, who arrive at Hogwarts to interrogate Albus Dumbledore about Newt Scamander’s whereabouts. “I have some questions for you, professor,” a man drawls to Albus Dumbledore, still a professor of Transfiguration at Hogwarts. But this shot is off-putting. The group interrogating Dumbledore about Newt Scamander’s whereabouts is not the same one that walked into Hogwarts in the last shot. Leta Lestrange and her bright purple dress are nowhere to be seen, and the group looks even larger. Are they both from the Ministry of Magic? Newt repairs a teared up postcard that comes from Paris. A message from Dumbledore perhaps? And who tore it up to begin with? Another familiar sight: a mysterious, shadowed being using the Deluminator, the magical device that can remove all light sources nearby. For years it belonged to Dumbledore, until he passed it on to Ron Weasley in Harry Potter and the Deathly Hallows. So we can assume that this is Dumbledore going incognito to meet Newt. It feels like a fitting introduction — the very first scene in Harry Potter was Dumbledore pulling out the Deluminator, after all. Before Newt jets off to Paris, we see him first in London — as evidenced by the red telephone booth and the London postcode on the sign behind him. And who does he spot? Dumbledore! This flies in the face of Dumbledore’s casual denial of secretly working with Newt. The two of them have a clandestine meeting on the roofs of London. Newt looks characteristically nervous while the young Dumbledore laughs charmingly. The official is played by Derek Riddel, who was cast as Torquil Travers. The name sound familiar? Travers was the surname of a Death Eater in the Harry Potter series — which makes this official a distant relative of one of the minions of Voldemort. That suddenly gives a much more sinister tone to his veiled threats to Dumbledore, and begs the question of whether Grindelwald has allies planted in the Ministry of Magic. First, I want to know when Dumbledore traded in his snazzy suits for the serious cloaks and robes that he wears as an older man. I hope it’s not anytime soon, because damn, can he wear a three-piece suit. Law is playing Dumbledore with a sort of easy sensuality, which makes him the scene-stealer of this trailer. But his motives are a little more uncertain: Why does he charge Newt with going up against Grindelwald but not fight him himself? Our first glimpse at the titular Grindelwald in the trailer is a fleeting image of his back. He stands on a stage (at trial?) with his ally Vinda Rosier (Poppy Corby-Tuech). Wearing a darker bob and a darker coat, Tina Goldstein is back. We last left her at the docks of New York City, where she bid Newt goodbye and made him promise to send her his book. In this trailer, Tina appears to be attempting to be discreet, sneaking about London or Paris. Judging by the statues behind her, she may be near where Newt and Dumbledore first meet. Jacob Kowalski (Dan Fogler)has returned! Despite having his memory erased at the end of Fantastic Beasts and Where to Find Them, our favorite New Yorker No-Maj is back. He seems just as confused as he was before he discovered magic, so this may show Jacob on the cusp of regaining his memories. Newt seems to have no qualms about throwing Jacob back into the fray with his animals and his new mission. The two of them pack up to go to Paris, in a hurry and soaking wet for some reason. Speaking of returns, here we get a glimpse of Credence (Ezra Miller) learning to control his Obscurial powers. He appeared to have died at the end of Fantastic Beasts and Where to Find Them, but he is quite alive in the sequel. Not only has he gained control of his destructive powers, he has also gained a new friend, a Maledictus witch played by Claudia Kim. A Maledictus is a person whose blood was cursed, leading them to turn into a beast. Credence and the witch seem to have found kindred spirits in each other. Here we get our first look at the Paris Ministry of Magic, constructed to look like a series of glass domes. It actually calls to mind the Louvre, the famous French museum that features a beautiful glass pyramid. And in the French Ministry of Magic, we see Queenie Goldstein (Alison Sudol) snooping around. Queenie proved to be a perfect ally to Newt for espionage work, using her natural power of Legilimens to read minds. Here we have a beautiful shot of an ethereal dance performance at a ball. It seems to have little to do with the film — except for one of the party attendees. Leta Lestrange! We get our first full shot of Leta Lestrange in party garb, admiring the performance before shifting her eyes. No wonder she seems suspicious: Leta hails from the Lestrange family, an ancient pure-blood family that looks down on Muggle-born and half-blood witches and wizards. Because of that, they practice inter-marriage within a small pool of elite pure-bloods. Many of the pure-blood families would end up allying with Voldemort decades later in his attempt to rid the world of half-bloods — including Leta’s descendent, Bellatrix Lestrange. But Leta may be bucking the trend, currently engaged to Thesus Scamander, a wizard with questionable blood status. And she has a past with Newt, who still harbors feelings of love for her, keeping her picture in his case. Speaking of the Lestrange’s, her we see a mysterious wall with glowing scribbles and graphs drawn all over it. The largest text on the wall reads ” Corvus Lestrange.” A family tree? A sinister scheme? It’s difficult to tell. More difficult to tell is the person looking at the wall, but from his silhouette, I would guess Dumbledore. An enchanted circus in Paris shows children gleefully floating in giant bubbles, and attendees excitedly crowding inside to glimpse the latest beastly attraction. No doubt this will draw the attention of the achingly sympathetic Newt, who will probably try to release the creatures. Not Newt, but new wizard Yusuf Kama (William Nadylam) has appeared at the circus, concerned over whatever is caged there. We know nothing about Yusuf Kama, but we can assume he is one of the good guys who potentially allies himself with Newt. This isn’t all that important of a shot but Pickett is back! And he’s still adorable! The mischevious Bowtruckle almost escapes from Newt’s care again, but is quickly caught. He’s just here to be cute and remind you that this movie is still about beasts. Two flamboyantly sinister henchman drive a carriage pulled by thestrals into a stormy night sky, followed by two wizards on broomstick. Thestrals are by no means evil — though their bony, black form certainly look scary — having once been used by Harry and his friends to fly from Hogwarts. But here they are used for evil means, as part of Grindelwald’s escape. Another unexpected surprise: It’s not Newt who frees the caged creatures at the circus, but Credence. He seems to have found his way to Paris and gotten himself a haircut. We cut immediately to this devastating wreckage — but is that Grindelwald down there in the building, or Credence unable to control his Obscurial powers still? And here we have our first full shot of Grindelwald. It’s curious that the title character — even if he is the villain — has remained out of the spotlight for much of the trailer, but it may have to do with the controversy surrounding the retention of Depp. This scene appears to be a flashback, showing a long-haired Grindelwald being arrested. Or it could be that a decent amout of time has passed since he was arrested and his hair and beard have grown while imprisoned. “I can’t move against Grindelwald. It has to be you,” Dumbledore tells Newt. This gives credence (heh) to the theory that the Ministry has been compromised, and that Dumbledore is under careful watch from his enemies. At last we see Newt in action — something that rarely happened in the last film. Newt is generally a soft-spoken, pacifist wizard, preferring his creatures over human beings. While he will leap into action to contain vicious beasts, he would never exchange blows with someone — as opposed to his hyper-masculine war hero brother Theseus, who stands beside him here. But despite tension between the two of them, they seem to have teamed up against some nameless threat. In a very cool shot, both Newt and Thesus bring their wands crashing down to the ground, creating this bright stream of red light that seems to act as a barrier of sorts. In a blink-and-you’ll-miss-it moment, wisps of magical smoke briefly form the shape of the Deathly Hallows. The Deathly Hallows were three items that were thought to bring the owner immortality and immense power. The search for the legendary Deathly Hallows was what first united Grindelwald and Dumbledore, two old friends (and possible lovers) who beloved in their existence. But the quest is what ultimately tore them apart, as Grindelwald slowly revealed that he dreamed of acquiring the Deathly Hallows to rule over the Muggles. The Hallows were never once mentioned in Fantastic Beasts and Where to Find Them, but with Dumbledore and Grindelwald’s conflict taking center stage of the action in this sequel, it’s inevitable that we’d return to them. Harry Potter would eventually end up the owner of all three — throwing them away before we saw the full extent of their power. But this ominous image hints that we could see the Deathly Hallows again. Following yesterday's teaser trailer, Warner Bros. has released over twenty hi-res promotional stills, spotlighting each magical moment as Newt Scamander & Albus Dumbledore team-up against Grindelwald! While we've already seen a pretty great breakdown today, Warner Bros. has also released eighteen new promotional stills from Fantastic Beasts: The Crimes of Grindelwald that are basically hi-resolution screenshots, which give us a much closer look at some of the trailer's key moments. A few of the older stills we saw a few months back have also now been released in hi-res. Academy Award-winner Eddie Redmayne returns as Newt Scamander and is joined by fellow Fantastic Beasts co-stars Katherine Waterston, Dan Fogler, Alison Sudol, Ezra Miller, Zoë Kravitz, Carmen Ejogo, Kevin Guthrie, and 3x Academy Award-nominee Johnny Depp. Joining the franchise for Chapter 2 are Callum Turner, Claudia Kim, William Nadylam, Poppy Corby-Tuech, Ólafur Darri Ólafsson, Brontis Jodorowsky, Ingvar Eggert Sigurðsson, David Sakurai, Derek Riddell, Wolf Roth, Victoria Yeates, Cornell John, Fiona Glascott, and Jessica Williams. Back to Hogwarts we go in a scene from Warner Bros. Pictures' fantasy adventure "FANTASTIC BEASTS: THE CRIMES OF GRINDELWALD,” a Warner Bros. Pictures release. EDDIE REDMAYNE as Newt Scamander in Warner Bros. Pictures' fantasy adventure "FANTASTIC BEASTS: THE CRIMES OF GRINDELWALD,” a Warner Bros. Pictures release. JUDE LAW as young ALBUS DUMBLEDORE in Warner Bros. Pictures' fantasy adventure "FANTASTIC BEASTS: THE CRIMES OF GRINDELWALD,” a Warner Bros. Pictures release. 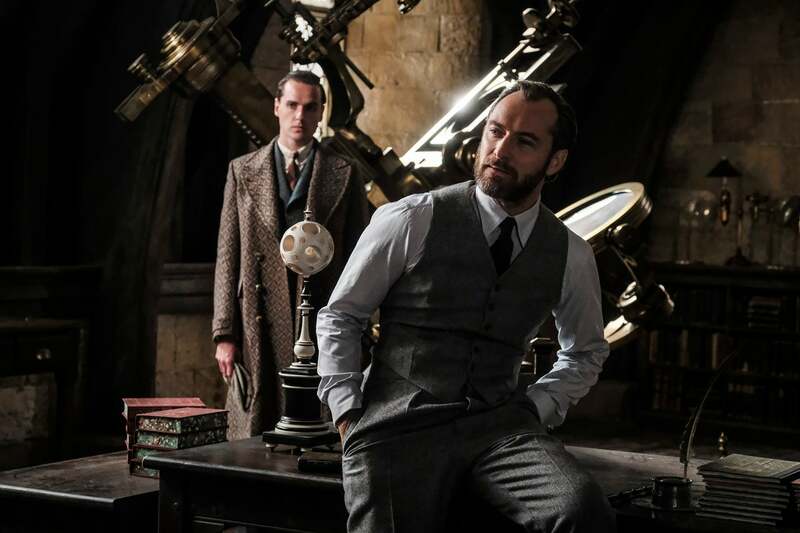 (L-R) JUDE LAW as young ALBUS DUMBLEDORE and EDDIE REDMAYNE as Newt Scamander in Warner Bros. Pictures' fantasy adventure "FANTASTIC BEASTS: THE CRIMES OF GRINDELWALD,” a Warner Bros. Pictures release. 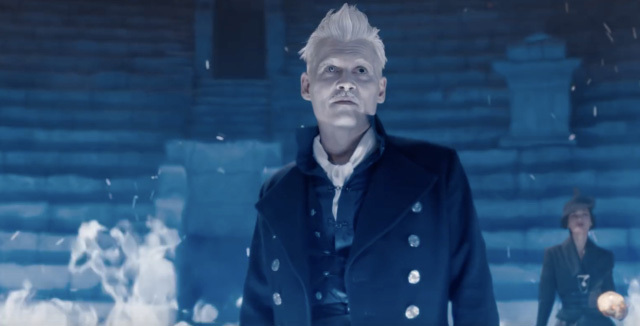 JOHNNY DEPP as GELLART GRINDELWALD stands trial in a scene from Warner Bros. Pictures' fantasy adventure "FANTASTIC BEASTS: THE CRIMES OF GRINDELWALD,” a Warner Bros. Pictures release. A scene from Warner Bros. Pictures' fantasy adventure "FANTASTIC BEASTS: THE CRIMES OF GRINDELWALD,” a Warner Bros. Pictures release. ALISON SUDOL as Queenie Goldstein in Warner Bros. Pictures' fantasy adventure "FANTASTIC BEASTS: THE CRIMES OF GRINDELWALD,” a Warner Bros. Pictures release. 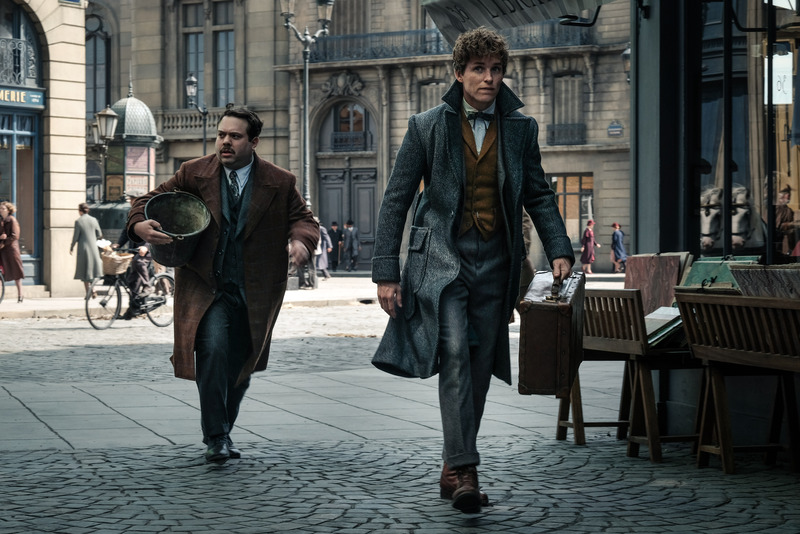 (L-r) DAN FOGLER as Jacob Kowalski and EDDIE REDMAYNE as Newt Scamander in Warner Bros. Pictures' fantasy adventure "FANTASTIC BEASTS: THE CRIMES OF GRINDELWALD,” a Warner Bros. Pictures release. (L-r) CLAUDIA KIM as Maledictus and EZRA MILLER as Credence in Warner Bros. Pictures' fantasy adventure "FANTASTIC BEASTS: THE CRIMES OF GRINDELWALD,” a Warner Bros. Pictures release. CLAUDIA KIM as Maledictus in Warner Bros. Pictures' fantasy adventure "FANTASTIC BEASTS: THE CRIMES OF GRINDELWALD,” a Warner Bros. Pictures release. ZOË KRAVITZ as Leta Lestrange in Warner Bros. Pictures' fantasy adventure "FANTASTIC BEASTS: THE CRIMES OF GRINDELWALD,” a Warner Bros. Pictures release. WILLIAM NADYLAM as Yusuf Kama in Warner Bros. Pictures' fantasy adventure "FANTASTIC BEASTS: THE CRIMES OF GRINDELWALD,” a Warner Bros. Pictures release. The bowtruckle PICKETT in a scene from Warner Bros. Pictures' fantasy adventure "FANTASTIC BEASTS: THE CRIMES OF GRINDELWALD,” a Warner Bros. Pictures release. EDDIE REDMAYNE as Newt Scamander in Warner Bros. Pictures' fantasy adventure "FANTASTIC BEASTS: THE CRIMES OF GRINDELWALD," a Warner Bros. Pictures release. (L-r) JOHNNY DEPP as Gellart Grindelwald and POPPY CORBY-TUECH as Vinda Rosier in Warner Bros. Pictures' fantasy adventure "FANTASTIC BEASTS: THE CRIMES OF GRINDELWALD," a Warner Bros. Pictures release. 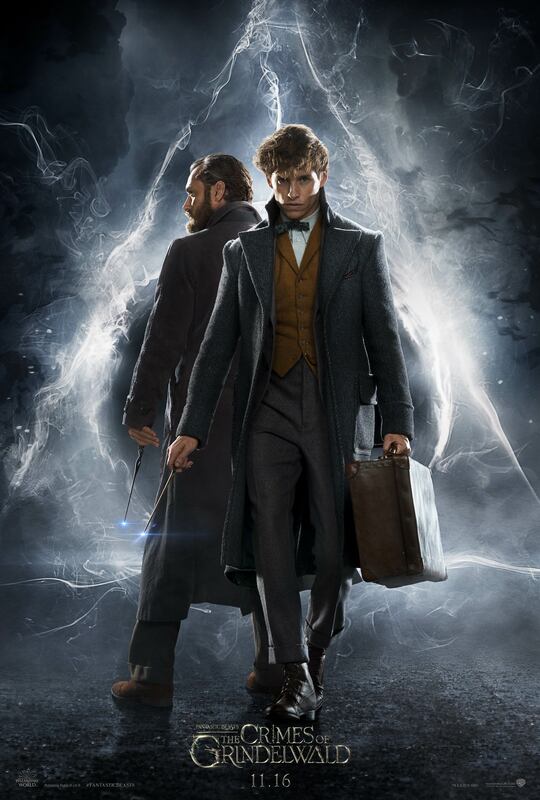 (L-r) JUDE LAW as Albus Dumbledore and EDDIE REDMAYNE as Newt Scamander on the official teaser poster for Warner Bros. Pictures' fantasy adventure "FANTASTIC BEASTS: THE CRIMES OF GRINDELWALD,” a Warner Bros. Pictures release. saura Barbé-Brown (Legends) is set to appear in the upcoming Fantastic Beastssequel, Fantastic Beasts: The Crimes of Grindelwald, Heroic Hollywood has exclusively learned. According to multiple insiders, Barbé-Brown will appear as Laurena Kama, the first wife of Corvus Lestrange and mother of Leta Lestrange, played by Zoe Kravitz. 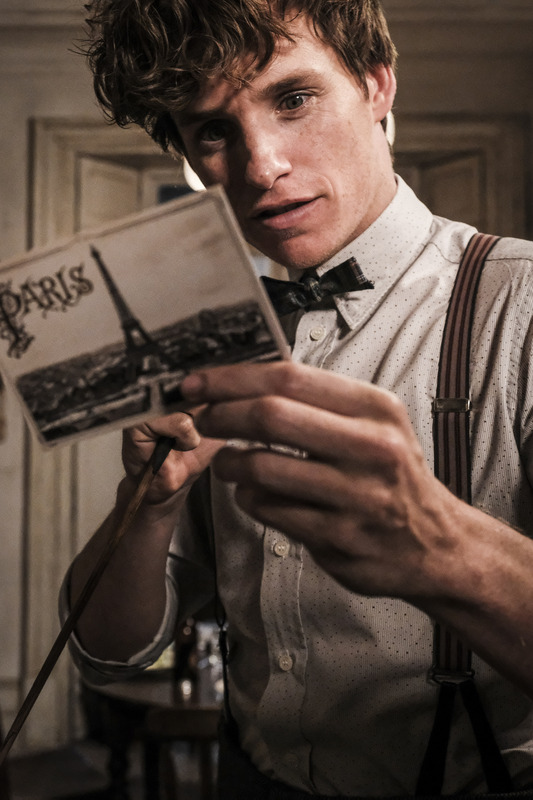 The sequel, which is set in Paris, France, features the return of Eddie Redmayne as Newt Scamander as he embarks on his latest journey, joined by Hogwarts professor Albus Dumbledore (Jude Law). Harry Potter fans recently spotted a potential spoiler in the film’s teaser trailer which featured a family tree for Corvus Lestrange that seemed to reveal Kravitz’s character as the half-sister of Credence Barebone (Ezra Miller). This would ultimately connect the new characters of the Fantastic Beasts franchise to the original Harry Potter film series — specifically Bellatrix Lestrange — although it is unclear as to how Bellatrix relates to Leta and Credence. Directed by David Yates, Fantastic Beasts: The Crimes of Grindelwald stars Eddie Redmayne, Katherine Waterston, Alison Sudol, Dan Fogler, Johnny Depp, Ezra Miller, Jude Law, Zoë Kravitz, Callum Turner, David Sakurai, Claudia Kim, Brontis Jodorowsky, Wolf Roth, Victoria Yeates, Derek Riddell, Poppy Corby-Tuech, and Cornell S. John. Fantastic Beasts is about to make a comeback, and it will do so with a slew of new characters. Newt Scamander will be joined by the likes of Albus Dumbledore as the wizard finds himself caught in the midst of a brewing war. Oh, and it seems audiences will also get a peek into the character's history if a new still from Fantastic Beasts: The Crimes of Grindelwald says anything. Not long ago, Entertainment Weekly shared an exclusive look at a young version of Newt Scamander. The image confirms the awaited sequel will toe into the wizard's youth and the mentor-pupil relationship Newt built with Professor Dumbledore during his short time at Hogwarts. Also, it doesn't hurt that Newt is pretty dang adorable. Some things never change, huh? (Photo: Entertainment Weekly ) As you can see, Newt is pictured in his draping Hogwarts robes while Dumbledore stands behind him. The boy, who was clearly sorted into Hufflepuff, is seen pointing his wand at something off screen. Newt looks more than a little concerned as he prepares to shoot off a spell, but Dumbledore doesn't look too concerned. The young man looks downright calm in his sweater vest, so that has to count for something. So far, there is no word on what this scene might be about, but fans do have their guesses. In the Harry Potter universe, Newt was ultimately expelled from Hogwarts -- despite Dumbledore's objection - after he put one of his classmate's life at risk. The first Fantastic Beasts film confirmed the ordeal involved a mysterious magical beast, so this still might be showing the moments before that incident goes down. Whatever the reason, Fantastic Beasts: The Crimes of Grindelwald will feature flashbacks into Newt's past, and fans are sure the scenes will be as sweet as they are angsty. The movie will also see an older Newt meet up with Dumbledore following his latest adventure when the Hogwarts professor requests help in capturing a now-escaped Grindelwald. Taking place all over the world, this magical sequel will explore plenty of new stories and answer some long-standing questions about Newt along the way. Starring Eddie Redmayne, Katherine Waterston, Ezra Miller, Alison Sudol, Dan Fogler, Zoe Kravitz, Claudia Kim, Johnny Depp, and Jude Law, Fantastic Beasts: The Crimes of Grindelwald opens November 16, followed by the yet-to-be-named Fantastic Beasts 3 on November 20, 2020. In a matter of months, the Wizarding World will get a bit bigger thanks to J.K. Rowling. The franchise will expand when Fantastic Beasts: The Crimes of Grindelwald is released, giving fans a new look at Albus Dumbledore. Now, Jude Law is opening up about his big role, and the actor has something to say about the controversy his character drummed up. Recently, Law spoke with Entertainment Weekly about playing a younger version of Dumbledore. It was there the actor was asked about the on-going controversy surrounding how the wizard’s sexuality is depicted, and Law urged fans to be patient. “Jo Rowling revealed some years back that Dumbledore was gay. That was a question I actually asked Jo and she said, yes, he’s gay. But as with humans, your sexuality doesn’t necessarily define you; he’s multifaceted,” Law said. Continuing, Law said this sequel will not reveal all things about Dumbledore in one go. Of course, Harry Potter fans will know why this topic has become a sensitive one. After the novels wrapped, Rowling confirmed Dumbledore was gay, but there were some fans upset by the character’s decision to keep his sexuality quiet. His big-screen inclusion in the Fantastic Beasts series made those fans wish for an opaque address of Dumbledore’s LGBT sexuality, but the director of The Crimes of Grindelwald said that it wouldn’t be explored in the sequel. With several films left to go, there is plenty of room for Fantastic Beasts to explore Dumbledore’s most personal relationships. Law understands the concerns fans have, but this new interview shows the actor understands the long-game in play. So, there is hope yet for Dumbledore to address his sexuality further down the line. What do you make of this new interview with Law regarding Dumbledore's sexuality? Let me know in the comments or hit me up on Twitter @MeganPetersCB to talk all things comics and anime! One of the reasons Fantastic Beasts: The Crimes of Grindelwald is so highly anticipated is the prospect of seeing a young, hot Dumbledore played by Jude Law. Well, and the fact that it’s part of a spin-off from the most beloved children’s fantasy series ever. And while we’ve been gifted with a few great shots of Dumbledore lounging in a dapper, tailored suit, one of the most important aspects of Dumbledore’s youth has been largely left out: his sexuality. In the second film of the Fantastic Beasts franchise, the Wizarding World lore will dive deep into Dumbledore’s backstory and his conflicted relationship with the series’ Big Bad, Grindelwald (Johnny Depp). But it seems like Fantastic Beasts is playing the long game: in Fantastic Beasts 2 Dumbledore and Grindelwald will share no scenes together. Why is this such a strange revelation? Because Dumbledore, who has been revealed to be canonically gay by Harry Potter author J.K. Rowling (who is also penning the Fantastic Beasts screenplays) and to have had a deep, unrequited relationship with Grindelwald. “Dumbledore fell in love with Grindelwald, and that added to his horror when Grindelwald showed himself to be what he was,” she revealed to a crowd of Potter fans in 2007. So it’s strange that two characters who have had a deep relationship with each other would not cross paths in the film that introduces the overwhelming threat of Grindelwald. (It also proves how easy it would have been to recast Depp after his allegations surfaced, but that’s neither here nor there). First, let’s give this the benefit of the doubt. Fantastic Beasts is set to become a five-movie series, fleshing out the Wizarding World in the decades before Harry Potter even existed. The Fantastic Beasts series could be playing the long game when it comes to introducing Dumbledore and Grindelwald’s relationship, perhaps building to an emotional reveal in a later movie. But here’s the thing. Fantastic Beasts director David Yates (who also directed the last four Harry Potter movies) has said that Dumbledore’s sexuality will “not explicitly” be explored in the second Fantastic Beasts movie. Of course, this doesn’t preclude the series from acknowledging that Dumbledore is gay in later films, but it does cast a troublesome shadow over the series. Will the franchise’s first major canonically gay character’s sexuality be retroactively erased? Was Rowling simply making an empty gesture to LGBT communities by establishing Dumbledore’s sexuality after the book series was wrapped? It’s too soon to say for now, but let’s hope that those pesky thoughts will be unequivocally proven false in the future. Warner Bros. has kickstarted their SDCC presentation with a magical new trailer for Fantastic Beasts: The Crimes of Grindelwald, featuring Gellart Grindelwald wreaking all kinds of havoc. This November, get ready to reenter J.K. Rowling's beloved Wizarding World of Harry Potter with the eagerly-awaited Fantastic Beasts: The Crimes of Grindelwald. Following a fun panel discussion, which included a surprise appearance from Johnny Depp in character, Warner Bros. just released their first trailer of the day, which features plenty of magical mayhem as Gellert Grindelwald (Johnny Depp) escapes captivity and sets his sights on Newt Scamander (Eddie Redmayne) and his friends while also setting a dastardly new plan in motion. Fantastic Beasts: The Crimes of Grindelwald may touch on Dumbledore's sexuality and his relationship with Grindelwald after all. The second trailer for Fantastic Beasts 2has released and (along with a first look at Nicolas Flamel) one shot in particular has got people talking. The character of Grindelwald was introduced to fans of J.K. Rowling's books back in her first novel, Harry Potter and the Sorcerer's Stone. There, all Rowling revealed was that Dumbledore had famously dueled the dark wizard in 1945. It wasn't until the final book, Harry Potter and the Deathly Hallows, that Rowling revealed the twisted and tragic history between the two sorcerers; they had once been friends, and indeed the young Albus Dumbledore had found Grindelwald's philosophy attractive for a time. It took the tragic death of Albus's sister to open his eyes to Grindelwald's evil. Rowling later revealed that Dumbledore's attraction to Grindelwald ran deeper than that. She confirmed that she always imagined Dumbledore as being gay, and that he cared deeply about Grindelwald. The moment viewers heard that Dumbledore had been cast for Fantastic Beasts: The Crimes of Grindelwald, they began to hope that this would actually be addressed in the film. Unfortunately, director David Yates soon dispelled those hopes by suggesting the movie would "not explicitly" deal with this issue. But the trailer released at SDCC has suggested there may be some slightly more overt references. The trailer includes one scene in which Dumbledore explains to Newt that he cannot move against Grindelwald. The first trailer had suggested that this was as much a matter of politics as anything else, with hints that Dumbledore was restrained by the Ministry of Magic. This time, though, the dialogue was carefully placed over a scene in which Dumbledore stared into the Mirror of Erised, and saw Grindelwald's reflection. The Mirror of Erised appeared in the very first Harry Potter story. It's an ancient magical mirror, and anyone who gazes into it sees the deepest desire of their hearts. Harry, for example, saw his parents. As Dumbledore warned Harry, men have wasted away staring into the Mirror of Erised, lost in their own longings. And when Dumbledore gazes into it, he sees Grindelwald. Could this be a hint at the feelings he holds for Gelert, with that informing the plot? It's certainly easy to understand why that would lead Dumbledore to second-guess himself, fearing that he wouldn't actually be able to fight Grindelwald at all. This is only a subtle detail, but it's an important one. It reassures viewers that there may not actually be the "gay erasure" many had feared; rather, J.K. Rowling is taking her usual approach to storytelling - dropping subtle hints, that she later develops. In a recent interview, Jude Law noted that this is one thing he most admires about Rowling's writing. "She reveals her characters," he explained, "peels them to the heart over time. You’re just getting to know Albus in this film, and there’s obviously a lot more to come." Even if Fantastic Beasts: The Crimes of Grindelwald doesn't explicitly reference Dumbledore's secret love for Grindelwald, the trailer suggests that it will nevertheless offer some not-so-subtle hints. Given that's the case, the relationship between the two is sure to move to center-stage as Fantastic Beasts progress. After all, the final film ends in 1945, the year of Albus's fateful final encounter with Grindelwald. I feel like Newt's skillset is quite unique, and I don't just mean with beasts. I mean with empathy. His capacity to see broken people and to reach out to broken people is a skillset which is pretty unique. And it's one of the things that Dumbledore has always, since he was a kid, seen in Newt. And the complexity of the... if, you know, if it is building to a showdown between these two -- [Jo Rowling]'s created a scenario that's not as simple as the two can just face off. And actually, Dumbledore needs to recruit the skillset of Newt to help. Even though Gellert Grindelwald (played by Johhny Depp in the first movie, and now the sequel) hasn't played a significant role in any Harry Potter films, his name is very familiar to the devoted fans of the series. Those who have kept up with the stories outside of the Potter books, proper, know that Gellert Grindelwald is an evil and powerful wizard, second on the Horrible Wizards food chain to only He Who Must Not Be Named. And yet, as legend has it, Grindelwald and Albus Dumbledore were friends when each man was much younger. The two men shared an interest in the Deathly Hallows. They also wanted to work together to create a new world order where wizards ruled over Muggles. But they had a falling out (it's a very long story), and Grindelwald set out to complete their mission on his own... Muggles be damned. Gellert Grindelwald's reign casts a very large shadow over the story of Fantastic Beasts and Where to Find Them, and the future, planned sequels in this franchise. Because in the moment, Beasts occupies a place on the timeline before Dumbledore has been forced to confront his old friend, and powerful rival, Grindelwald. The confrontation is coming, it will involve an Elder Wand, and now we know that Newt's inherent ability to recognize empathy in given individuals will be extremely important to Dumbledore's move to bring Grindelwald down. The road to the big battle has only just begun, and the journey will continue when David Yates brings Fantastic Beasts: The Crimes of Grindelwald to theaters on November 16. We will have lots more from our set visit in the coming days, so keep checking CinemaBlend and have your wands ready. I think the French Ministry is pretty bloody beautiful. I think it's one of Stuart [Craig]'s most beautiful sets. I think a lot of it will be augmented in the digital space, but the detail, the filigree... and also, just from a practical point of view, how it's been multipurpose. Because we go into different parts of the French Ministry, and we've had to repurpose one set for different levels and different things -- and how flexible it is. ... From a visual point of view, it feels very French, and extraordinary magical. All Jo [Rowling] said in the script was that it was this kind of nouveau building, and underground. And the problem with being underground is, there's no light. And nouveau is all about light and nature and these beautiful kinds of organic shapes. And when you're underground it's just like a big cave, you know? And so Stuart [Craig] decided to ignore pretty much the fact it was underground. He's put it underground, but it has a glass roof, and it's kind of a magical glass roof. There are all these domes and it's very similar to the gardens. There's a building in Paris it's quite similar to. But on the domes, there are projections of magical creatures being projected around. And we sculpted all of these beautiful statues. And we are able to back up David Heyman and Martin Foley's claims, as the practical set for the French Ministry of Magic was one of the builds that CinemaBlend was able to tour while visiting the production of Fantastic Beasts: The Crimes of Grindelwald, and it was a majestic location. Massive, even, with arched floors and towering file cabinets that moved around -- either by magic, or by the magic of filmmaking -- to create a sense of constant motion and flow. One thing that might not be perceptible in the finished cut of the film, though, is the amount of detail that is found on a set like the French Ministry of Magic. As we walked around at look at desks in the offices, they were littered with paperwork that had details about wizards, Muggles, case files that locations that had nothing to do with the story in question, and probably wouldn't be seen by David Yates' camera. And yet, the production team goes to those lengths to paint in the lines, developing this world with rich textures and details. It's exquisite. The first Fantastic Beasts movie went out of its way to stand apart from the pre-existing Harry Potter films. Not that it could ever separate itself completely from that world. Both are born from the mind of J.K. Rowling, and both occupy corners of the author's vast Wizarding World. But Fantastic Beasts and Where to Find Themavoided direct references to anything familiar from the Harry Potter world, resting on the shoulders of new characters such as Newt Scamander (Eddie Redmayne), Tina Goldstein (Katherine Waterston), Credence Barebone (Ezra Miller), the No-Maj Jacob Kowalski (Dan Fogler) and the menacing Gellert Grindelwald (Johnny Depp). Not [just] going back to Hogwarts. Going back to the world of... it's seeing Dumbledore. How great is that? Seeing a younger Dumbledore, and seeing he and Newt's first meeting, I think, will be a thing that the fans will really love. Because here is this character who's so -- you know, we have such a connection to, who is such a central part of the Harry Potter stories. And to see him earlier on, as it were, very much, related to the Dumbledore of... I'd say, 'of old,' but of future. But at the same time, you realize in the Potter films that he was working things to his own end. He knew the path. He knew what was happening. He understood the back stories, and he was working Harry. I mean, in some ways, you could say, responsibly putting Harry into great danger, at times. But he had faith in Harry and his ability. While here, you see Dumbledore, and there are remnants of that and you see echoes of that. But he's also wonderful and colorful and magical and wise, and the character that we know, but younger, and we see slightly different shades. It was something that evolved in the developing process. Because we were introducing Dumbledore, it felt right to bring that world back into this one. We're there very briefly. You know, right in the middle of the movie, we go back for about 10 minutes to Hogwarts, and see it in 1927. It was a very organic natural part of the development process that took us back there. It's a part of Hogwarts that we've never seen before. It's like a secret cubbyhole space where Newt keeps some things. And it's just so... it's a tiny set, but it's really cute. Leta's someone who Newt had a very close relationship with. And I think that at Hogwarts... they were at Hogwarts together, and one of the things I think we will enjoy is, Newt was always -- you know, just like his love of beasts, he always saw the good in people. And Leta is someone who, I think, wrestles with that a little bit, just in her... she's from a family. She's from a pureblood family. And that whole thing of, 'what you're born and who you are' is an element of her character. Yes. Who is Kama? Uh.. Kama's a really -- Kama's a wizard who has a mission. And he needs to fulfill that mission within this story. And, he has a kind of tragic past, and a wonderful actor we've got playing him called William Nadylam. Brilliant. Kama, a great character. He's someone who's come in search of answers. And he goes on -- uh, I can't tell you what those answers are, or what the questions are. But he is a person with a wound, an emotional wound that he is trying to find answers for. Mysterious! Just when we think we have a pretty good handle on the direction of Fantastic Beasts: The Crimes of Grindelwald, seeing as how it will reintroduce Dumbledore (Jude Law) and set the mighty wizard on a path of confrontation with Gellert Grindelwald (Johnny Depp), we get this new wrinkle with an original character named Kama, who is wounded, and is on a search for answers that will put him in the path of all of our beloved Fantastic Beasts characters.